My father passed away on March 8, 1972, the day following my birthday. One day our house was full of people and laughter and the following day too it was full of people and film stars only this time there was no laughter only tears. Recently my neighbour was telling me," I remember Rajesh Khanna crying, I was trying to console him, your father was truly loved by everyone". Yes he was. 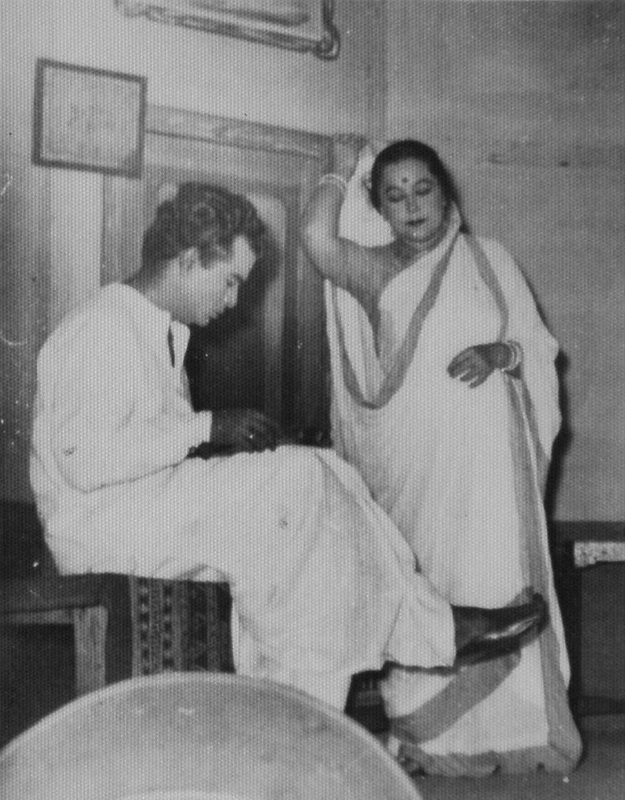 Since March 8 just went by I thought it was okay to interrupt my posts on Bimal Roy and unlock some personal memories. I raided the cupboard and decided to post some of those precious memories right here. My father was born on September 14, 1928, that is a long time ago, those days cameras were not as ubiquitous as they are now, therefore we have only a few photos of his childhood. 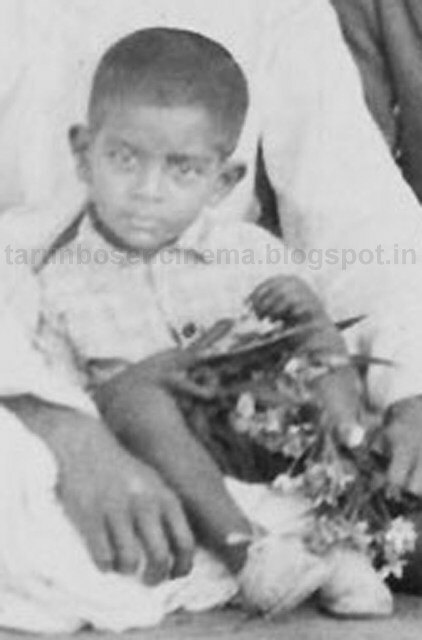 He was about four or five years old in this photo you see on the left, he is seated on somebody's lap. I can almost see the future actor in those expressive eyes. My father loved dogs and my brother has taken after him. His first dog was named Jack. Dad brought home Jack when he was a little puppy and comfortably fit into his coat pocket. 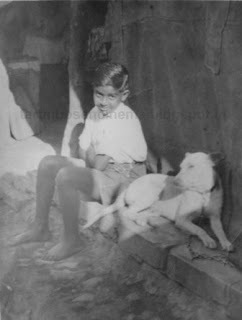 Winters in Nagpur where my father was brought up can be quite severe and it was one winter that dad carried the little pup in the pocket of his coat and brought him home.In the picture below (right) he is seen with Jack. After Jack Lalu walked into my father's life. He was special, on cold winter nights he insisted on sharing dad's bed and quilt. A slight sound outside and he would jump up barking taking the quilt with him leaving dad shivering. 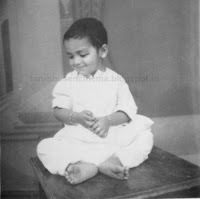 After dad's marriage he became mum's close companion and later my brother's caretaker; yes caretaker, when my brother slept my parents warned Lalu,"No sound the child is asleep". 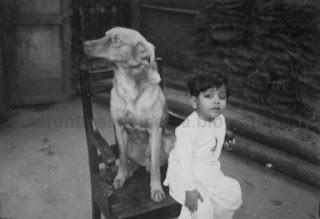 Lalu obeyed but did not hesitate to start barking when he saw a little sparrow chirping, he probably thought the bird'ds chirping would wake up the child. In the picture below Lalu is seen with my cousin who now leads a retired life. When this picture was taken the Bengali film Lalu Bhulu (it was the original version of the Hindi film Dosti.) 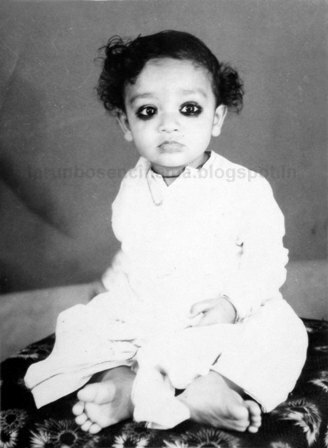 had just released so this photograph was named Lalu Bhulu. Right from his childhood my father was passionate about acting, all he ever wanted to be, was an actor. During his college days he was the secretary of the drama club. 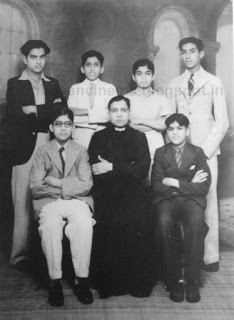 In the picture below he is seen with his college mates and I think the priest seated in the centre is the college's principal. My parents got married in 1949. The picture below was taken a year after their marriage. Two years after their marriage my parents were expecting their first child and the doctor set the delivery date sometime in September. Dad was thrilled. He later told me,"You know Shilpi I was so thrilled I was hoping the child would share my birthday." It was a son born on September 5, but unfortunately the child passed away soon after he was born. It was a loss my father never really got over. However, happiness soon came into their lives in the form of this little fellow. Doesn't my brother look absolutely cute in the pictures below. as played the lead in several plays. Once he went to Calcutta and saw the hit play 'Ulka'. There was a Bengali film too based on the same story. The film was later remade into Hindi as 'Meri Soorat Teri Aankhen'. My father was bowled over by 'Ulka'. 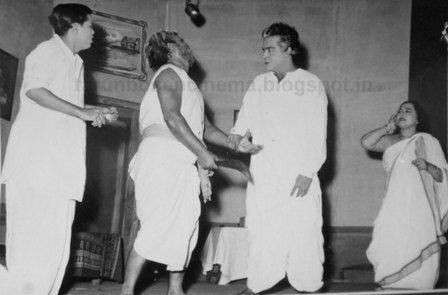 He decided to stage it in Nagpur, he directed it and played the lead that is, he played the role which Ashok Kumar played in the film. The play was a hit and his acting, direction as well as his make-up of an ugly man came in for a great deal of praise. 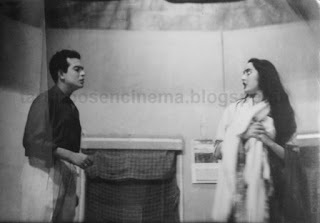 I do not have any photographs from 'Ulka' but the photos above are from some other plays he did while still in Nagpur. The photographs below are from some of the plays he did in Bombay. I never saw him act on stage, by the time I grew up he had already given up stage acting. Acting both in films and on the stage was taking a toll of his family life. My brother though, has few wonderful memories of those days. 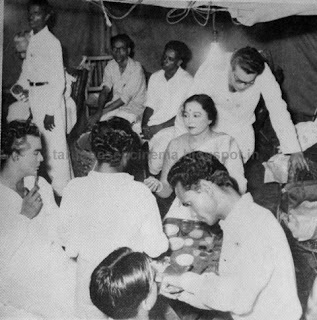 This is a picture of the green room, my father is seated (extreme left) with pipe in hand. I did mention he held a government job. He worked in the Post and Telegraph department. In the picture below, he is seen with his office colleagues being introduced to the Governor, my father is standing on the left. Opportunity knocked on his door when the principal of Nagpur's St. Francis School approached my father and his friends with the request to stage a play; they were going to start a college and they needed funds for the college building. The friends zeroed in on a successful play 'Aur Yeh Insaan'. there was a major hitch however, the play had been staged several times so the question was, will the people purchase tickets to see the play again? A famous chief guest could solve the problem, people would eagerly go to see the chief guest and who better than a film personality? 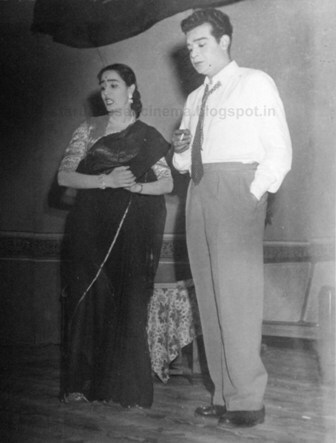 They decided on Nutan but she declined as she was busy, the next film personality on their list was Bimal Roy. My father would have none of it, he was cynical about film people. He said film people have their nakhras (I do not know how to translate this word into English). He felt his stand was vindicated when Mr. Roy failed to arrive on the appointed day, he had missed his flight. Needless to mention, my father had this "I told you so" attitude. He told mum, "I told them but they just won't listen to me, now see the play has to be cancelled". Thank God, his friends did not listen to him, the play was finally staged on another day and this time Bimal Roy made it. Who benefitted from all this? My father of course. Soon after the play ended, Roy approached dad and made him an offer to act in films. Finally my father saw his dream of being a film actor coming true. 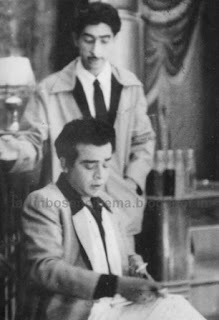 Below are scenes from the play, this was a serio-comic role, my father loved playing such roles, unfortunately he did not get too many of them in films. 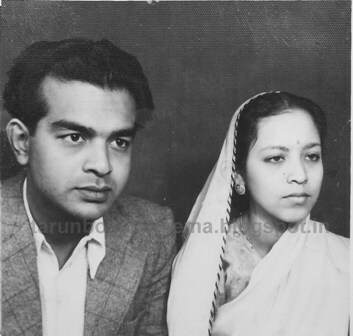 Life in Bombay was wonderful for my parents. Below he is seen with Abhi Bhattacharya probably in a studio compound,sometime during those early years in Bombay. 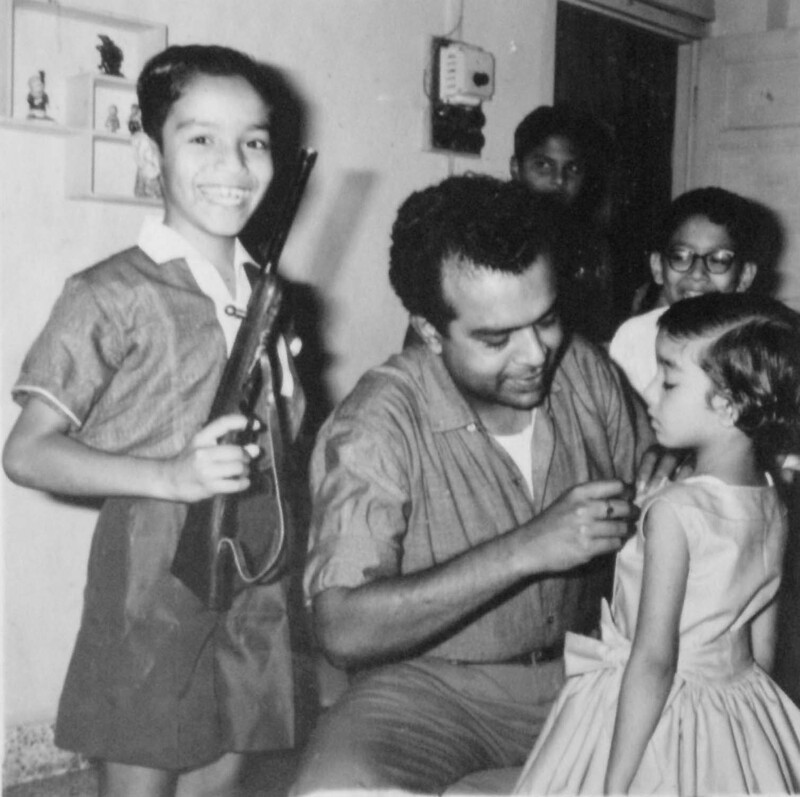 Life for my father was however not complete, had he been alive today, he would have been the perfect ambassador for the girl child. He did not have a sister and he missed one all his life. He missed not having anyone tying a rakhi or applying the auspicious tilak on his forehead during bhai dooj. When he learnt that mum was again expecting a child he desperately prayed for a daughter. His prayers were answered and yours truly entered his life. 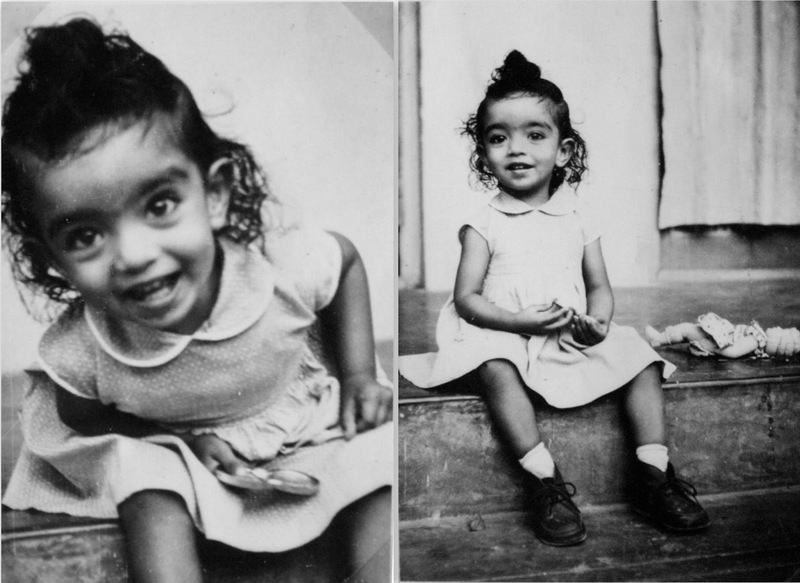 (Left) I was ten days old, (centre and right) about four or five months old on a family picnic at Elephanta caves. My father was so happy that he would show visitors my tiny dresses drying on the clothes. He would say,"Doesn't the home look wonderful with a little girl's dress". Yes I was pampered and I think it is apparent from the two photos below. I was a little less than two and my brother recalls that my father wanted me to pose with the doll but I just kept the doll aside and insisted on taking the cover of the camera's lens in my hand. non-smoker like my brother, he would have lived longer and not lived up to his name, Tarun after all means young. 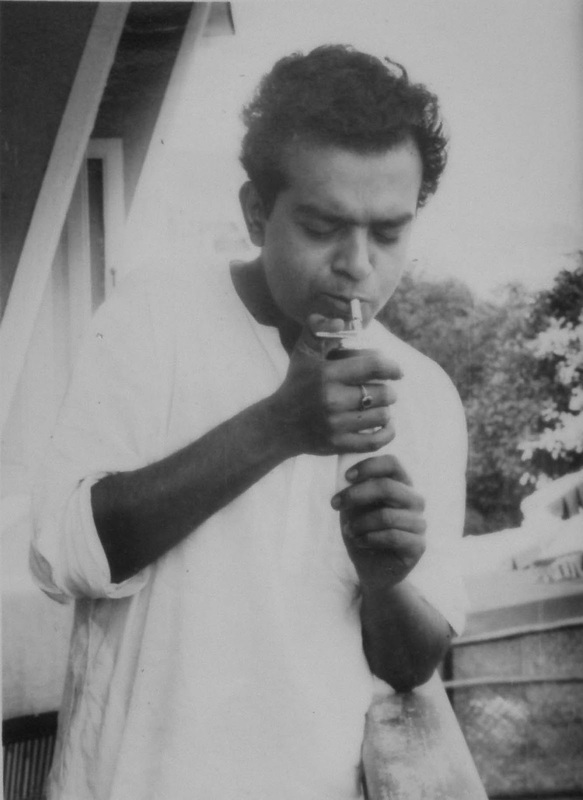 Cigarette smoking is truly injurious to one's health. The photographs above and below were taken on my brother's birthday. My father is pinning the Indian flag on my dress, you see my brother was born on Republic Day, January 26. My brother is standing beside him. 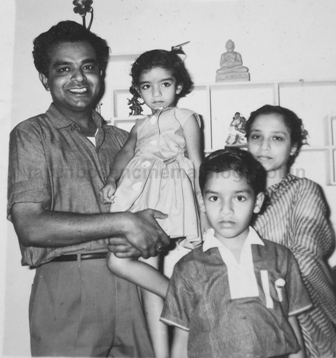 In the photo below you can see the silver jubilee trophy of Sujata, it is the silver plated sunflower right on top of my father's head. 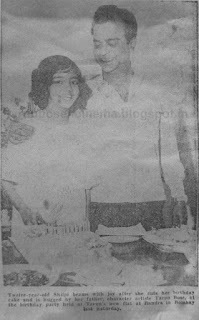 I had a grand birthday celebration in 1970, this photograph appeared in the film weekly 'Screen', I stumbled upon this paper cutting and I felt like sharing it, for this was the last time I celebrated my birthday. My father was a fun person, he became a child with kids, see the photo below, he is at his mischievous best here. I have watched actors closely and one thing that I have noticed about them is that in the presence of a photographer they automatically tilt their head to the right angle. I am sure they are not even conscious of doing so, my father was no different but here he went all out to have some fun. The lights were switched off and my father flashed the table lamp on his face from below and my brother clicked this lovely photo. This was taken approximately a year before he passed away. I end with this photograph, this was the last picture that my brother took of dad. He was going out for a formal dinner party. I will be back with my posts on Bimal Roy and this time I will be discussing Sujata but as usual I will take a little time, so please bear with me. Oh, Shilpi, *hugs* I know that loss will never quite leave you, so it all the more sweet of you to share these memories of your father! And all these personal photographs just made it all the more wonderful. I was surprised to read that your father's death anniversary is also on the 8th - because I just wrote a post on Van Shipley, who also died on the 8th. Thanks Anu. 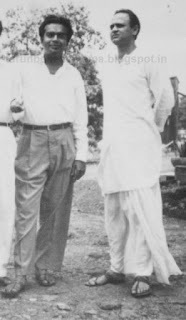 I am always running short of time, will read your post on Mr.Shipley, I have briefly met him in playback singer Talat Mehmood's house. Oh, what a beautiful post this is, Shilpi! Thank you SO MUCH for sharing memories about your dad with all of us. I read every word here with great interest. The pictures are also fantastic. Am glad you have these pictures at least. Each one of them is very precious. Btw, the English word for nakhras could be "airs"? Thank you Raja, very very much both for your comment and for the English word for nakhra. I think you got it right. Thanks for sharing your personal memories witth us. The photos and your memories came up alive. 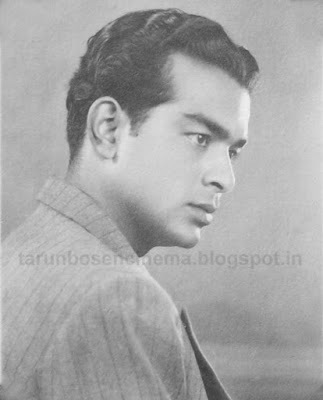 Can you please tell us which year it was that your father met Bimal Roy? When did he start working at the Post and Telegraph Dept.? Which was his first film? I presume his first film was with Bimal Roy. How was it for him to adapt to acting under other directors? Sorry that I am posing so many questions. Thanks for the interest Harvey, you are not imposing on me but giving me direction. 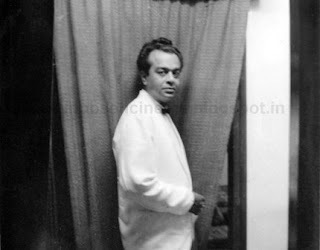 I will try to answer your questions in my next post, my mother is not around but my brother knows a bit more than I do, besides I will also need to do some digging around in the cupboard for the letter written by Bimal Roy to my father. Looking forward to yoru next post! thank you! Wonderful post, Shilpi! Thank you for sharing so many memories of your Dad with all of us here. I loved those pictures of your Dad, especially the one taken by your brother. Incidentally, my Dad also worked in the Posts and Telegraphs Department, but he was about 9 years older than your dad. I wonder if they ever met. Lalitha glad you liked it, did your father work in Nagpur? Yes, he did work in Nagpur for a few years. 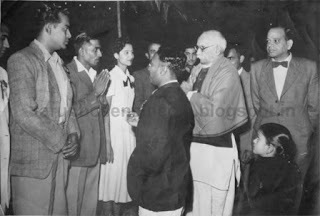 I think it was between 1948 and 1955 - just a guess, but I think he was in Nagpur when he got married, which was in 1949. Maybe they knew each other, who knows? Yes who knows? Some questions will remain unanswered, frustrating isn't it? Shilpi, this is such an absolutely unforgettable piece of writing. I loved every bit of it - the history, the humour, the joy, the sadness. Such a touching and beautiful, yet not melodramatic tribute to your father. Love all the photos too (and you were such a sweet little girl!). Incidentally, my father is exactly 10 years younger than yours - down to the date. September 14. Madhu, no wonder we are usually on the same page, after all our fathers shared the same birth date. Thank you so much for the kind words. It is very encouraging. Long gaps notwithstanding I will try my best to carry on with this blog, I have loads to share. I do not want to neglect my food blog so I guess the gaps are inevitable. This was just fantastic read with images, Tarunda n family :), since we grew up with the Golden era he represented we feel we are also still part of it and living thru it. Wonderful Shilpi. Thanks a lot. 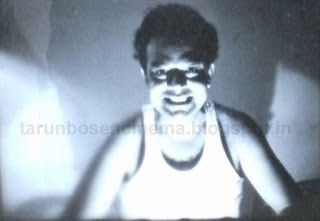 If Dada had got any chance to Direct a movie of his choice ie Socio related issues, that would been a icing on the cake :), and the SS from Screen, Dada looks to be ailing and seems to have lost some weight.Btw during the same time I have a SS to share from CHHOTI BAHU 1971, seen with Nirupaben Roy. This was written by Vishwamitter Adiland Directed by K B Tilak if I am not mistaken. No Ash my father was not ailing at that time, he was hale and hearty, it is just that it is a paper cutting gone completely brown after all it is decades old. Yes Ash dad did want to direct a film. I plan to do a post on Chhoti Bahu later. 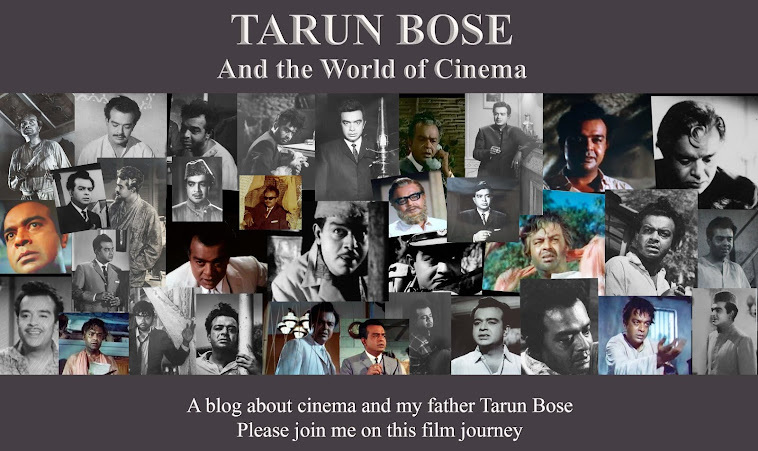 I join all the readers in thier appreciation of having shared the meories of not only Tarun Bose, but those of a father as well, so lucidly, intimately and vividly. Very touching, Shilpi. Thank you for sharing your memories, and the day full of his memories, with us. I love the two pctures of yours with the camera lens especially the one where you are with that mischievous expression. Thank you once again for this lovely post. Thank you very much pacifist. Yes don't I look full of mischief, my mum used to say that I may have been a little mischievous but thankfully,for my parents, I wasn't destructive. Awesome tribute to Father from his adroable n lovable daughter. U have made hom proud. Shilpi am speachless ......... for you have done a wonderful job. I read thru every single word and njoyed it throughly.U have now mastered the knack of writing the blog with so much of sincerity and truthfulness that it comes out absolutely superclass.G8 going n thirsty for more.Take care . Thank you very much Rajee. Thank you very much, glad you liked the post. Lovely, touching post and what an amazing blog! This is a treasure trove of information - and thank you very much, Shilpi - for sharing these memories, pictures and sending me the link yesterday. Thanks Harini, glad you liked it Harini. Your father looked imposing in Anupama, especially in the song with Surekha Parkar. Thanks for the wonderful post on your talented revered father. Thank you, hope you enjoyed the post. Thank you very much for this lovely comment. How did your dad pass away? Illness or all of a sudden? He was a very,very natural actor. I do not know whether you have gone through the entire blog, if you do you will see I published my final post on March 27, 2016. My father passed away suddenly after a sudden heart attack. Thank you so much for this wonderful comment. I am so glad you enjoyed it. 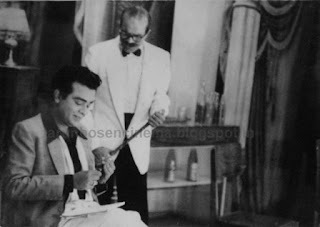 Dear Shilpi, thanks for a wonderful post.Your father was a wonderful actor and possesed a good voice. His dialogue delivery and accent was impeccable. His theatre days stood him in good stead.I enjoyed hia acting in Gumnaam, Anupama and Ganwar.